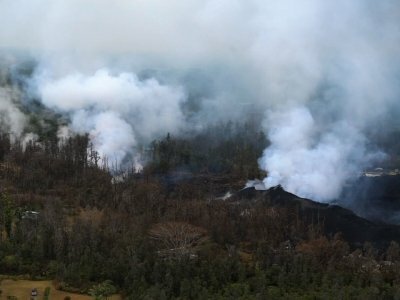 PAHOA, Hawaii (AP) — A new fissure in Hawaii’s Puna District sent gases and lava exploding into the air on Sunday, spurring officials to call for more evacuations as residents waited for a possible major eruption at Kilauea volcano’s summit. Hawaii County Civil Defense issued an emergency cellphone alert after the fissure was discovered early Sunday morning. The agency said one “unidentified structure” was destroyed by the new vent, bringing the total number of homes and other buildings lost to the lava to nearly 40. The U.S. Geological Survey’s Hawaiian Volcano Observatory said new fissures, ground deformation and abundant volcanic gases indicate eruptions on the eastern flank of Kilauea are likely to continue. “The appearance of the fissures in the past couple of days does not change the overall picture or concern,” USGS scientist Steve Brantley said.